Beauty is not just skin deep, it runs straight to the core. Virtu 3-layer is all wood, True Balanced Construction, wide plank flooring that is custom manufactured for aesthetics and stability in equal measure. 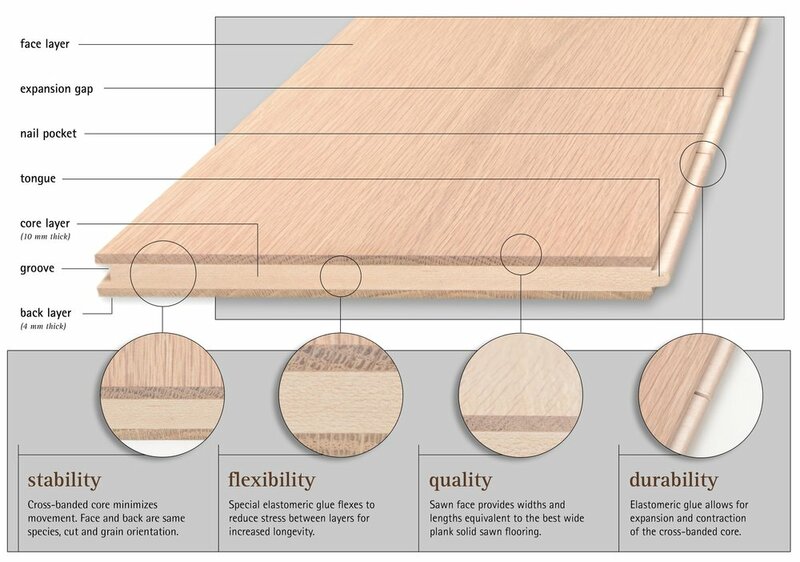 Originating in the European woodworking guild, True Balanced Construction is the most stable and durable wood flooring design available. The top and bottom layers of the floor are the same species, thickness and cut (flat sawn or quarter sawn), sandwiching a sturdy core running perpendicular to the face and back. The opposing face and back equalize the forces exerted by moisture related changes in dimension. The result: cupping is virtually eliminated as the stiff center core maintains flatness and reduces shrinkage up to 67% compared to solid wood flooring.